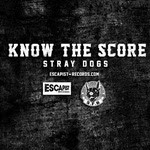 Escapist Records will release new Know The Score ep late this fall; "Titled Stray Dogs, the EP will contain all new material and be available in both vinyl and digital formats. The vinyl release will feature four different silk-screened covers that when placed together create a larger panel image. Meanwhile, the digital version of the EP will be available on a donation-based system with proceeds going to the South Florida Bullies Canine Rescue." Know the Score will enter the studio in early September to record for the effort, which they will be supporting with an appearance at Bringing It Back For The Kids Fest 2 in South Florida this October. Additional plans for an Eastcoast/Midwest trip and California trek are also in the works. Pre-order packages and brand new merch designs for the release will be launched in the near future; stay tuned for further details regarding the release.